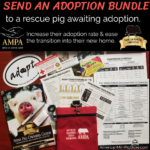 Adoption is a key component of rescuing pigs. The process of adopting out rescued pigs can be intimidating. Successful adoptions and legal protections for the adopted pig requires planning, legally binding documents, record keeping, screening, financial balance, veterinary care, and careful consideration throughout the process. This adoption section is dedicated to guiding rescue organizations through this important process.